MACH-V Series Crossover DP "Aerial Link"
WTI's MACH Series gives your system flexibility plus unmatched network security! 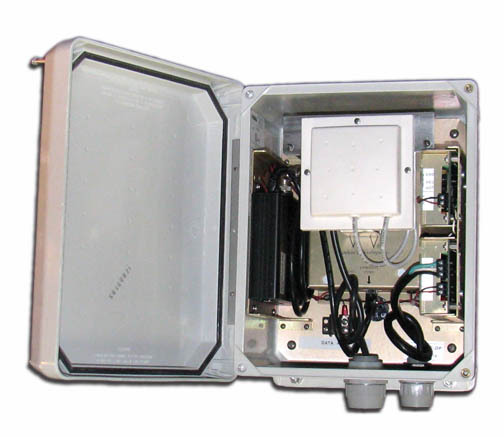 WTI's MACH-V Crossover DP wireless Ethernet radio "Aerial Link" is the definitive solution for aerial platform video connectivity. The MACH-V Crossover "Aerial Link" will deliver exceptional performance through all climates and offers a simple, easy and inexpensive alternative to cabling video. Whether it's analog or digital video the MACH-V Series digital IP radios are a practical alternative that provide unparalleled performance. WTI's MACH-V Crossover DP is designed for digital transmission of analog cameras (fixed or P/T/Z). The MACH-V Crossover DP "Aerial Link" converts a standard analog video signal into a MPEG-2, MPEG-4 or MJPEG digital signal. The digital signal is then transmitted and received by a remote MACH-V Crossover DP "Aerial Link." The remote unit then provides a digital video image which is viewable on a web browser or the video can be decoded back to analog for viewing with a traditional monitor. The MACH-V Crossover DP "Aerial Link" supports WTI's Sidewinder P/T/Z protocol and all other major manufacturer P/T/Z protocols. The MACH V Crossover DP "Aerial Link" facilitates the wireless connectivity of aerial mounted video and eliminates the burdensome task of plumbing cable through existing bundles. 5.8 GHz, 802.11a, OFDM transmission. Dual polarized - diversity patch antenna. *Lab tested theoretical data rate. Real world throughput with overhead consideration is 40Mbps (+).